Winter CSA Locavore Share - Sign Up Now! Posted 10/21/2014 3:47pm by Josie Hart. Winter CSA Shares make filling your kitchen with yummy local food, easy and affordable. Rancher Elin Parker Ganschow and Locavore founder Craig Taber forecasting for the coming winter. Westcliffe Colorado’s Music Meadow’s Ranch, protected forever on 4,000 conservation easement acres, is sustained by your support! Winter is almost here and so is the Locavore Winter CSA Share! Sign up now to receive a biweekly package of quality local food, delivered straight to your doorstep. You’ll save 30%- 40% from shopping at your grocery store. 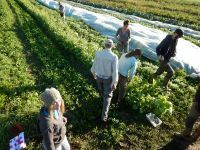 Strengthens the sustainability of front range ranches. Supplies you with the finest of Colorado proteins. Saves you money and time! Shares are first-come, first-served. A $50 deposit check reserves your spot, and the remaining balance will be billed later. Due to your fantastic summer support and the abundance of Colorado grass this summer, we have opened this offer to include your friends and neighbors as well. Please have them contact Jay, and feel free to share this email.